CHICAGO (October 11, 2018) – mHUB and DMDII celebrated the 2nd Annual Fourth Revolution Awards to recognize Midwest manufacturing for its leadership and innovation as the industry stands on the brink of a new technological revolution. The industry awards ceremony took place on October 10, 2018 at the Museum of Science and Industry and brought together more than 350 leaders in the manufacturing, corporate and civic sectors. The Community Empowerment Award recognizes a program or an initiative that promotes diversity and inclusion in manufacturing. Winner: Safer Foundation is one of the nation’s largest not-for-profit providers of services designed exclusively for people with criminal records. Its vision is equal employment opportunities for people with criminal records thereby improving the socio-economic well-being of the individual, their family, and community. “We are helping people with arrest or conviction records to become law abiding citizens. It has been a great privilege to do this work,” said Victor B. Dickson, president and CEO of Safer Foundation. The Product Design of the Year Award recognizes a product design that is unique, improves user experience, and impacts productivity as well as the greater good. Winner: Osteon Defender by Cast21 is a waterproof fracture orthotic fit that allows providers to confirm bone setting, joint orientation, and skin condition without removal of the cast because of the framework and radiolucent materials. The device eliminates the main complications in traditional orthopedic casts. “We have worked so hard over the past few years to create superior solutions for broken bones for both doctors and the patients. I am so inspired to be working with them every day. Thank you so much to the Fourth Revolution team, mHUB, and everyone who has supported our mission. It truly takes a community to build a startup,” said Ashley Moy, CEO of Cast21. The Small and Mid-Sized Manufacturer of the Year Award recognizes a small- or mid-sized manufacturer that has demonstrated its excellence in business practices, innovative processes, and productivity enhancements as well as contributions to its local community. Winner: Wiegel Tool Works (WTW) is a precision metal stamping company offering all phases of metal stamping production from early design concepts to tooling. They manufacture stampings to OEM and manufacturers in the automotive, aerospace, and telecom industries. “This is an amazing night and day for Wiegel Tool Works. It has been three generations of work in my family and this is a great accomplishment. Manufacturing is back, and it’s exciting!” said Aaron Wiegel, president and CEO of Wiegel Tool Works. The Innovation of the Year Award recognizes a technology or process that can advance multiple technologies and significantly improve the manufacturing ecosystem. Winner: Light Guide Systems by Ops Solutions is a product that standardizes manual processes using intelligent, projected work instructions directly on the product and process. The product combines the best of human intelligence and technology operating as a GPS for manual processes to optimize quality, productivity, and training efficiency. “We are honored to be here tonight and thank you for this award. Driving innovation in manufacturing is at the heart of our business model. We look forward to continuing to advance our partnership with mHUB and DMDII in the future,” said Paul Ryznar, CEO of OPS Solutions, maker of Light Guide Systems. The Startup of the Year Award recognizes an individual startup company for its innovation, creativity, and significant accomplishments in the region. Winner: Luna Lights’ mission is to keep older adults happy, healthy and safe without disruption of their daily lives. It is an ultra-thin pressure sensor that detects when a user gets out of bed and immediately turns on small, wireless lights around the home. The software component allows caregivers to identify trends in nighttime trips to forecast risks for falling. It provides a predictive, detective, and preventive experience. "On behalf of the Luna Lights team I'd like to thank the Fourth Revolution Awards for this incredible honor. We're passionate about improving the health, happiness, and independence of older adults, and if you are too please reach out as we firmly believe collaboration will drive this industry forward." Previously announced winners were Microsoft, Corporate Champion Award, Marmon Holdings, Manufacturer of the Year Award, and Brad Keywell, Fourth Revolution Champion. Event sponsors included Museum of Science and Industry, Arrow Electronics, Inc., Bank of America, BlueCross BlueShield of Illinois, JLL, KPMG, Marmon, MB Financial Bank, RW Ventures, UL, Uptake, WaterSaver, Wintrust, Accenture, Chamberlain Group, GCM Grosvenor, Granite Creek, Pritzker Group, Technology & Manufacturing Association (TMA), and Illinois Manufacturing Excellence Center (IMEC). 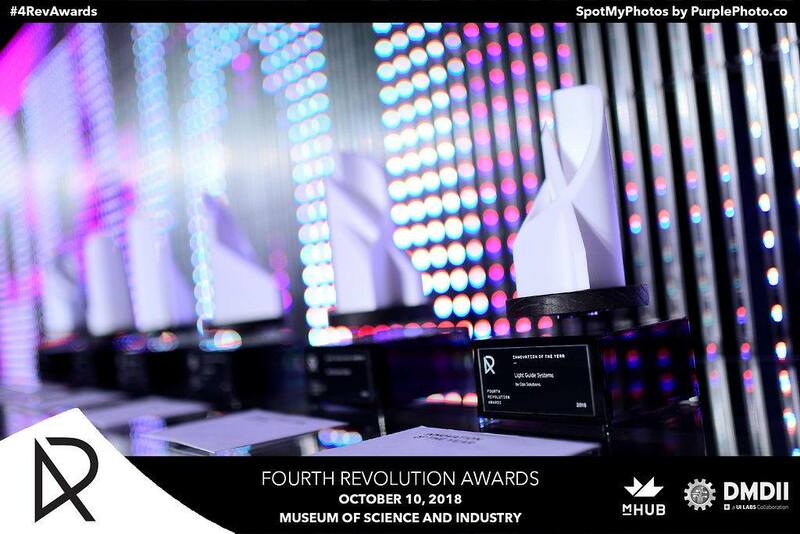 Congratulations to the winners of this year’s Fourth Revolution Awards. The Digital Manufacturing and Design Innovation Institute (DMDII) is an innovation space where manufacturers go to forge their futures. In partnership with UI LABS and the Department of Defense, DMDII equips U.S. factories with the digital tools and expertise they need to begin building every part better than the last. Its factory floor features some of the most advanced manufacturing equipment in the world, which partners can use for experimentation and training on everything from augmented reality to advanced simulation techniques.